Despite the furthering of knowledge in Computer Science, I felt that this course really enforced a discipline that would otherwise be lost on us homeschoolers. It helped me become independent and disciplined, which are two brilliantly valuable attributes in college preparation. Physics C Mechanics: University Physics Volume 1, OpenStax Collection, Rice University. This is an excellent free online text book. You can download this text and the student solutions manual here. Physics C Electricity & Magnetism: University Physics Volume 2, OpenStax Collection, Rice University. You can download this free online text and the student solutions manual here. 1. The first semester course that prepares the student to take the AP Physics C Mechanics test. 2. The slower paced full-year AP Physics Mechanics course that accomplishes the same objectives over a longer timeframe. 3. The second semester course that prepares the student for the AP Physics C Electricity and Magnetism test. The pacing and scope for each course is different based on the topics required for coverage by the College Board. The backbone of each course is self-study based on a wide variety of clearly defined sequential activities, but students will also have the support of the instructor through a discussion forum and through live (optional) video sessions held every other Wednesday at 12:00 noon (US Eastern Time). Students are not required to login to the video sessions, but attendance is highly recommended. Who should apply: These courses are open to students in grades 9 to 12 who have successfully completed one year of Physical Science or Chemistry (any level) and Algebra 2, and have either completed or will concurrently take a first-year calculus course. Motivated, qualified, and well-organized students who have the discipline to work hard consistently over the entire course will do well in AP Physics C. Students who are not "math-ready" or cannot consistently spend the necessary time on the material should not sign up for AP Physics C. It is expected that students will spend between 10 and 12 hours per week watching lectures, practicing problems, performing lab activities, and taking assessments. It is required that prospective students take the math-readiness test found at the instructor's website, physics-prep.com, prior to applying for the course. How to apply: The application for this course can be found here. Please do not apply until you have taken the math-readiness test and feel that you are prepared for the course. Students who sign up for the first semester Mechanics course will be working at a pace that allows them to take the Electricity and Magnetism course in the second semester. If the student finds the pacing of the first semester Mechanics course to be too quick, he or she can switch to the full-year Mechanics course at no cost. The deadline to make any course switch is November 15, 2019. Lab Materials: Most of the devices/materials needed to conduct the lab activities can be found in a typical household. Any materials that are not available can be inexpensively purchased at a hardware store or online. Schedule: The first semester Mechanics course will begin on August 21, 2019 and conclude on December 30, 2019. The full-year Mechanics course will begin on August 28, 2019 and conclude in May, 2020. The second semester Electricity and Magnetism course will begin on January 2, 2020 and conclude in May, 2020. Technical requirements: All students must have high-speed internet access, a scientific calculator, a scanner, and an email address. Course descriptions: AP Physics C Mechanics is a calculus-based course designed to expose the student to all the foundational topics needed to understand such concepts as motion, force, energy, momentum, rotation, harmonic motion, and gravitation. AP Physics C Electricity and Magnetism does the same for such phenomena as electric force, electric field, electric potential, electric circuits, magnetic effects, electromagnetic induction, and electrical energy. The program of study for each course is equivalent to a single semester college physics course for engineering students. These courses will fully prepare the student for the AP Physics C exams administered by the College Board every May. Students must have prerequisite knowledge in mathematics up to and including the level of calculus. Virtual and actual laboratory activities will prepare the student for lab-based questions on the AP Physics tests. Each unit of the courses contains a "workflow" that guides the student through the material found on the unit assessments. The workflow is a combination of video lectures, lab activities, practice problems with complete solutions, quizzes, and a unit test (see below). The courses are highly organized and easy to follow. A thorough review of the course work (with practice tests) occurs over several weeks prior to the AP test. How the courses work:These courses have three components: 1. Online learning based on self-study using the course resources. A lab notebook is required so that all lab activities are properly recorded for future use. Pacing guides are provided that will help the student appropriately cover each activity in a timely fashion. The suggested due dates for the assessments are found in the pacing guides. Deadlines for work in each unit will be provided as well. Work completed after the deadline will receive a score of zero. 2. A discussion forum where students can interact with the instructor and others in the same course. 3. Live video meetings are scheduled once every other Wednesday at 12:00 noon (US Eastern Time). The sessions last one hour. Student attendance is optional but highly recommended. During the live sessions the instructor will share information based on the suggested class schedule and be available to answer questions. 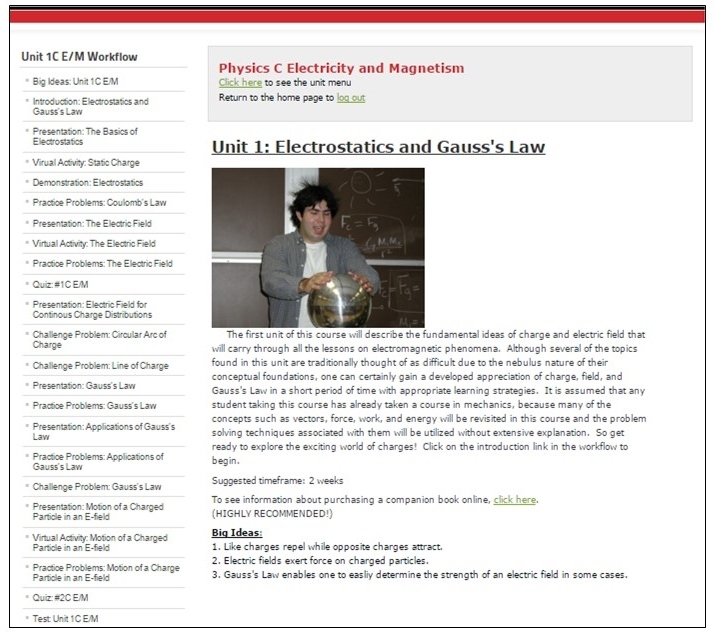 The live sessions are recorded (and posted on the Physics Prep website) for viewing at a later time. The multiple-choice sections of the quizzes and summative test found in each unit are scored by the computer and are used to determine student grades. Each test will also contain free-response questions (self-graded by the student based upon a scoring rubric) that are essential in the preparation for the AP Physics tests. Thus, the free-response work done by the student must be scanned into a computer and submitted to the instructor. If all free-response work for the course is submitted in a complete and acceptable format, the student grade will be increased based on the quality of the work, up to 5%. Lab reports are handled in the same manner. Specific lab reports, assigned by the instructor, are submitted for evaluation by the instructor. Failure to submit free-response work and lab reports will result in a lower course grade. Class information (with pacing guides, deadline dates, text readings, and suggested text-based practice problems) will be sent to the student in the summer prior to the start of the course. All registered students have access to a student dashboard where important course information, an online grade book, an assignment submission upload form, and live session recordings can be found. Instructor qualifications: Mr. Kernion is a veteran AP Physics teacher who has been guiding talented students for over 30 years. He earned a Bachelor of Science degree in Ceramic Science and Engineering at Penn State and began his career as a research engineer for US Steel. After taking science education courses at the University of Pittsburgh to gain secondary education certification in Physics and Chemistry, he began his teaching career in 1986. Mr. Kernion has also earned a Master of Arts degree in Liberal Studies from Duquesne University and is currently in the doctoral program for STEM Education at the University of Pittsburgh and will graduate in June of 2019. He has also served as the science department chair for the North Allegheny School District (one of Pennsylvania's most highly rated districts) for much of his teaching career, with a focus on curricular design and teacher training. One of the most important aspects of Mr. Kernion's teaching is his emphasis on methodology over memorization. His students learn the "Big Ideas," which he has been presenting for years, long before it was the latest trend in high school education. His courses emphasize this long-term learning method. Consequently, any student, regardless of his or her learning style, can easily plug into the flow of the course and gain a deep understanding of the material. This will be Mr. Kernion's fourth year with PA Homeschoolers. He is very excited to be a part of the faculty and to broaden his reach to the homeschool community. Interestingly, Mr. Kernion's twin brother, Mark, is an AP Chemistry teacher for PA Homeschoolers. The effectiveness of Mark's AP Chemistry course matches Jack's AP Physics courses due to similarity in style and rigor. Students who want to have a seamless AP science experience should consider both courses during their high school career.